What an amazing place! The formation of this beautiful Canyon poses a question: was it formed with a lot of water over a short period of time or, a little water over a long period of time? Looking north-west across the Canyon, can you imagine an ocean of water spilling across the continent, heading downhill, taking everything in its path! More importantly, an Event Horizon that boggles the mind exits in the depths of the Canyon, so travel down with us and see for yourself! Can a river eroding one grain of sand at a time leave the jagged edges in solid granite and lava? No, river and creek erosion form smooth walls. 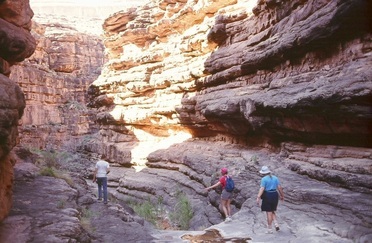 This is a cross-sectional view of the Canyon noting the various layers. 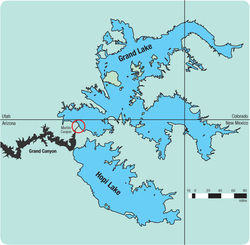 The red line denotes the Great Unconformity erosion line. 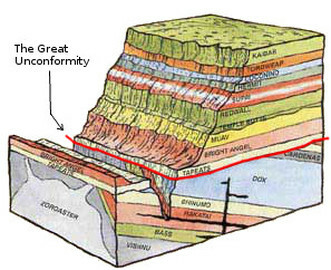 The Great Unconformity is an event horizon where high-speed water flows eroded the surface of huge granite blocks across much of the earth's surface, as well as the broad area called the Grand Canyon Supergroup (below the Red Line). Observe the tilt and fault lines of the Supergroup sediments, stacked below the red line. These were the original earth's surface before this event. Now they are eroded, broken, buried, and tilted. Wow, so what happened? It's obvious a huge fault occurred where the Supergroup rocks were catastrophically thrust up in this view. Interestingly, the Unkar/Chuar zone was in place before the Canyon-forming event and contains no fossils. We see that only a portion of this "original Earth" remains. Without a doubt, this cataclysmic feature in the earth's surface is an Event Horizon of Earth History. The Earth was a completely different place before and was utterly transformed by this event. The entire face was scraped flat and subsequently water-carried sediments were redeposited to leave behind what we see today in the Canyon and the entire World. Sometime in history we know the super-group layers were horizontal. Could these have been part of the earths surface that Adam walked on? They are sedimentary and cultivatable. The Bible records that the earth was made "out of water and with water". One cannot imagine nor conceive the colossal scale of the events that created these features and the environment on earth while this was happening. (see Dr. Walt Brown's Video below). The Tapeats overburden - over 1,000 ft thick and covers over a million square miles! In short summary, first, the original creation started with the basalt crust rocks, then sediments carried by water made the outer layers. Later something happened: the early earth's surface was destroyed catastrophically, shook by earthquakes, volcanic action, fast moving water and sediments! This is the exact sequence we see in the Canyon and other places on Earth. Remember the Nautiloids? 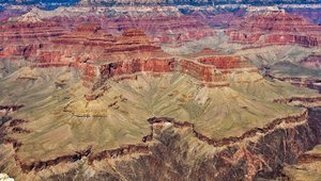 In the Grand Canyon there is a limestone layer that runs over 250 miles of the canyon from Arizona to Las Vegas that contains tens of millions of fossils with an average of one nautiloid fossil per four square meters, and nearly one in seven fossilized standing upright! 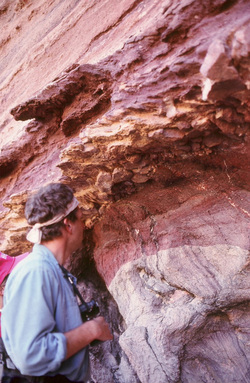 Famed geologist Dr. Steve Austin points out that this enormous nautiloid deposition covers more than 5,000 square miles, providing indisputable proof of the rapid formation of this limestone layer. (1) Contrast this with the textbook explanations which claim that such layers form extremely slowly as grain after grain settles to the bottom of a shallow and placid sea. (2) It should be noted that most of these creatures are of uniform age all across these rocks. The horizontal layers above the Unconformity have fossils of all types in abundance, hence their name - Cambrian. But why are there no fossils found in the "Pre-Cambrian" (pre-life) subset below the Unconformity? It's because God did not put life on the earth until He was done forming it. Fossils are made by quick sediment covering, otherwise they deteriorate and skeletal structures dismember. It should be noted that fauna from the Ordovician and Silurian are missing in the Canyon, fouling the Geologic chart of evolutionary Common Descent, (i.e. worms to man). Actually, creatures like Trilobites existed on the pre-flood sea floor here in great numbers. These animals have been found in soft body where their amazingly complex eye anatomy was studied. It turns out that they have a very complex lens, capable of adjusting for underwater aberration. Below the trilobites in the sea floor sediments we find worm fossils, so evolutionists claim trilobites came from worms! They don’t offer an explanation for the complex transition required or the eye problem, other than one day a worm had a light sensitive spot that evolved into an eye, then two! To postulate such fairy tales is telling of the evolutionist's rendering of earth history - a history they write to support their views, despite solid contrary evidence. The rocks below the Unconformity are melted granites and schist's. It takes immense heat to melt either. At this contact evolutionists claim that life began in "calm and placid seas". Somehow, 500 million years of their common descent time is missing here. One cannot help but be affected by venturing into the Canyon depths and reflecting about what the Rocks are really telling us. Not a "calm and placid" origin at all. This feature of the Earth is perfect evidence of the World-Wide Flood. God's Word tells us that the first judgment was by water, but another is coming by fire. We need to pay attention to these truths and warnings and search them out. The immensity of the Flood event challenges the ability of the mind to comprehend it. Reflecting upon it is both humbling and fearful at the same time. Trapping marine animals over 50ft in length, leaving them thousands of feet high in the mountains and the thousands of fossil beds, some containing Billions of creatures is mind-boggling to conceive. They and the people that perished are all calling to us, "See! Act!" Look at all this evidence! In Peru for example. over 350 whales of different species with a sloth we found, some in soft body. Dr. Brown's Video below will challenge your understanding of earth's first hydrological systems, which were spring head rivers and evening and morning dew without need of rainfall. This is completely unlike today's evaporation, condensation and rainfall systems that includes snow. Open to Genesis Chapters 1-10 and compare!